You can read this post in italian, going to her blog! Hi, everyone! Lisa here from Cucicucicoo! I’m so happy to be a guest of Irene’s here on Serger Pepper! Irene and I both are huge fans of using materials that we already have, so today I’d like to share a really useful refashioning tutorial with you. …except you look like a sack of potatoes in it? 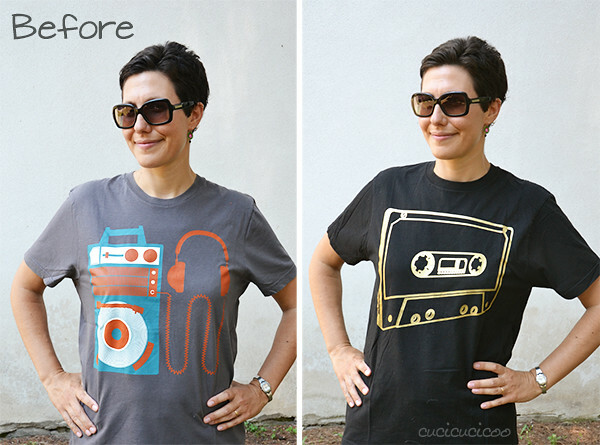 I scored these awesome music-themed graphic t-shirts from my husband’s bureau (I convinced him that he never wore them so he should give them to me! ), but I can’t stand wearing baggy t-shirts, especially when they bunch up under my armpits. Ugh! So, let’s do some quick surgery to girlify a men’s t-shirt! 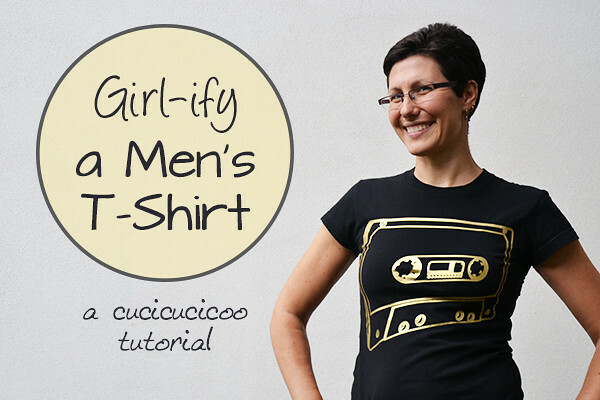 Turn your men’s t-shirt inside out and fold it in half the long way. Make sure that the inner layer of fabric reaches all the way to the fold and carefully line up the collar, shoulders and sides. 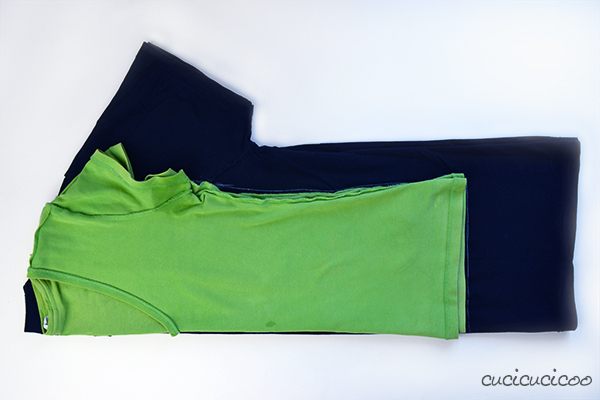 Then fold a t-shirt that fits you well the same way and line it up along the fold and shoulders. 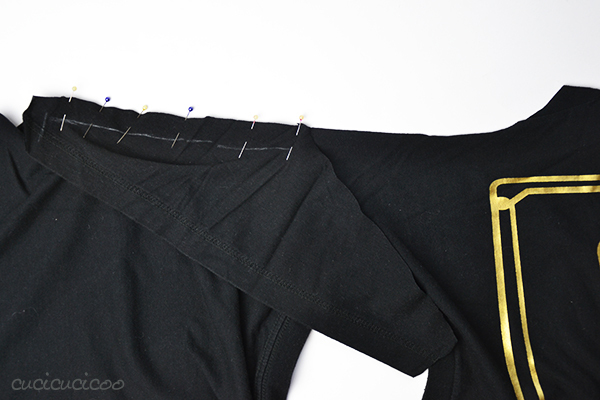 Trace around the bodice of the t-shirt with tailor’s chalk. Lift up the sleeves to trace along the seam that connects them to the bodice. Then line up the top fold and hem of the sleeves of both shirts and trace around them in the same way. 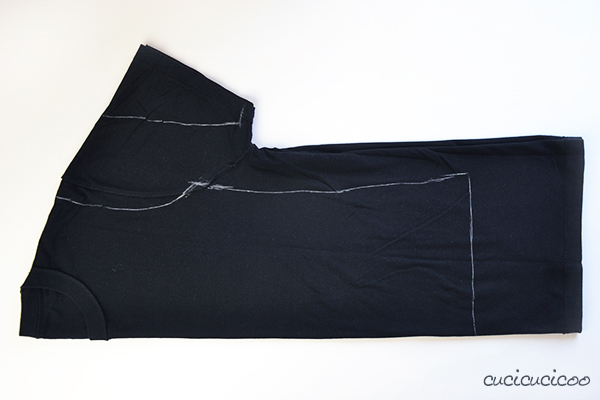 Cut 1 cm outside of the traced lines except at the very bottom of the shirt. 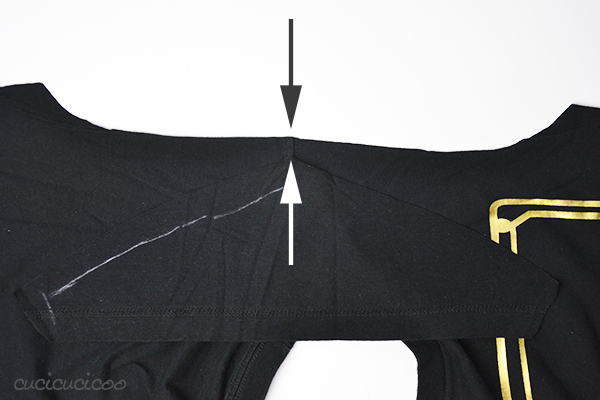 You’ll probably want to re-hem it, so cut about 4 cm outside of that line. Because of the much smaller sleeve size, the armpit ended up going over the sleeve seam, but don’t worry about it if it’s just a little bit. Note that not all t-shirts have the same stretch, so some might seem smaller, but can actually fit around you better than another that looks bigger but has less stretch. It’s therefore always wise to err on the large side when cutting out your pieces. You can always make them smaller, but it would be a little complicated to make them bigger! 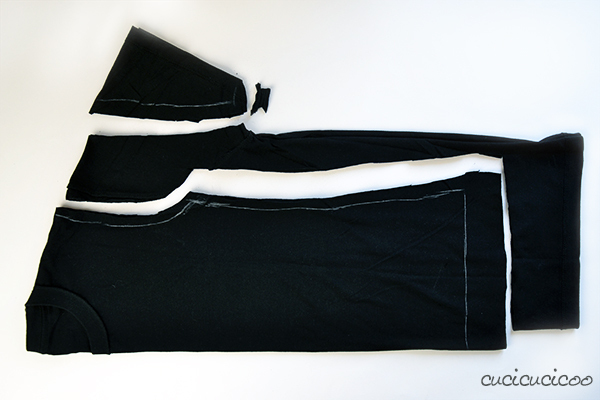 Open up and lay out the original shirt body piece and position one of the new cut sleeves on top of it, right sides facing. 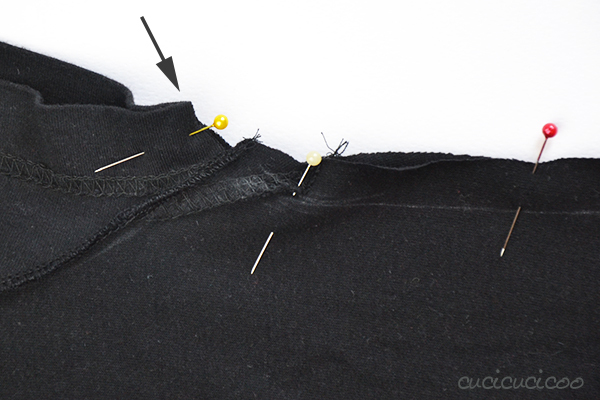 Take care to line up the center of the sleeve and the center of the armscye (where the sleeve attaches to the bodice). Start pinning the two edges together, working from the center towards one side. 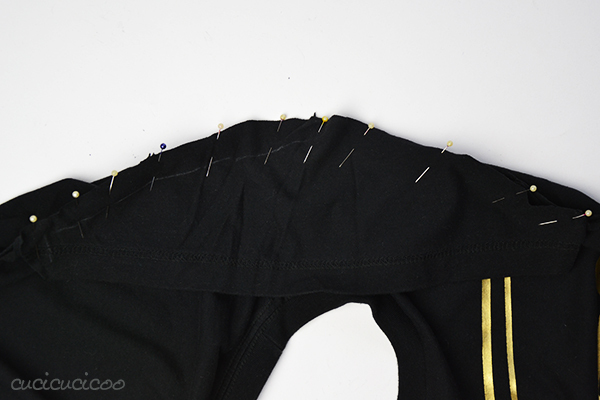 Then continue pinning from the center towards the other side. The two layers will not lay together flat, so you’ll have to maneuver them with your hands to fit them together. 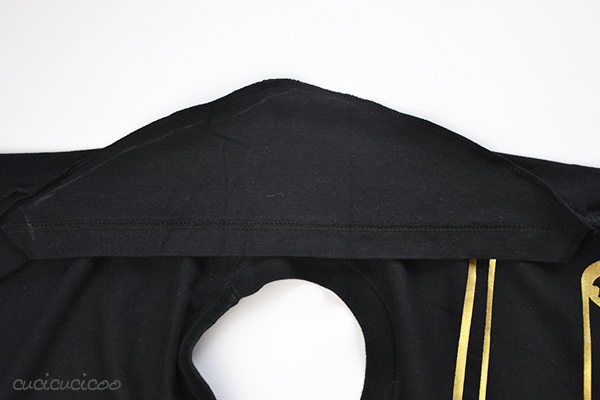 The ends of the sleeves should reach to the end of the armpit on the bodice. 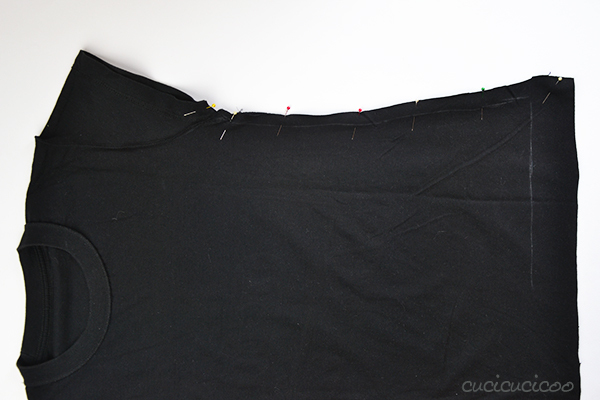 If you find that one end doesn’t reach over all the way and the other end goes too far, remove the pins and move the whole sleeve over a little bit and repin. Repeat with the other sleeve. 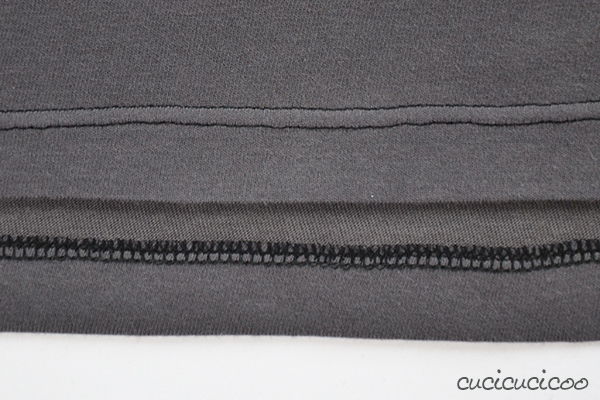 Remember how I had to cut into the armscye seam? This is what it looks like after the sleeve is reattached. There’s a bit of confusion of seams, but it really doesn’t bother me because you can’t really even notice the extra seam under your arm. 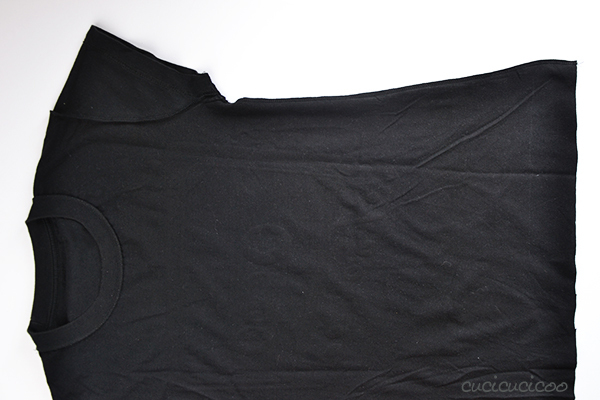 Now place your t-shirt flat with right sides facing. Line up the side edges and pin them together. 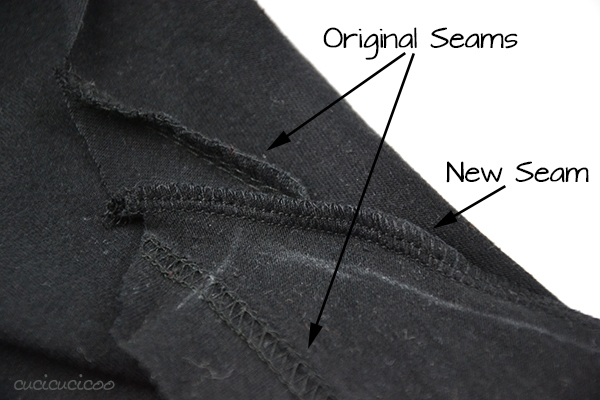 Sew from the sleeve hem all the way down to the bottom with a serger or triple straight stitch. Then do the same on the other side. Turn the shirt right way out and try it on. If it’s too wide, take in the side seams a little bit. Sooo much better now! The shirts have a much more feminine feel to them now and are so much more comfortable without all that excess fabric. That cassette tape is taking on some pretty bizarre curves, but my husband said that he likes it that way! Ha! And check out my awesome pits! 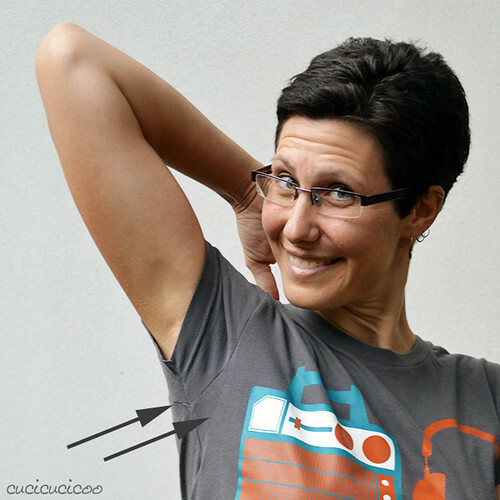 The shirts’ armpits are much slimmer now and you can only notice the extra seam from when cutting out the pieces if I walk around with my arms in the air and pointing it out. I’m certainly not going to lose any sleep over it! 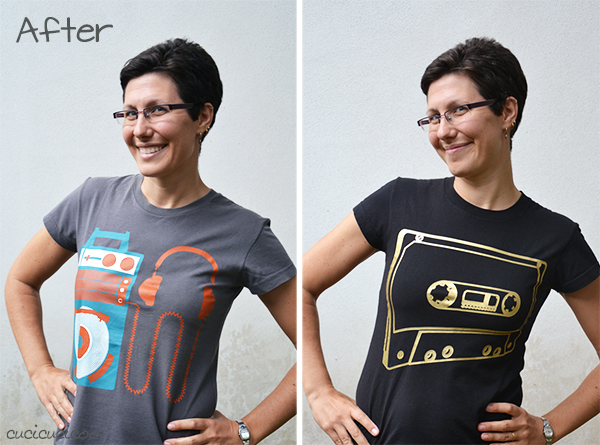 I love my new t-shirts and this is such an easy refashion! Just a quick note to tell you that, if you need a PDF pattern to quickly satisfy your sewing craving… just visit my shop, there’s a discount code for you! LOL, loved it when you said there wld be lots of arm pits. Great girlification! I love, As I told Lisa I like so much more feminine. Thank you very much for putting the tutorial is very well explained, comes in handy. Thanks for sharing. Almost every time I go to Target or Urban Outfitters, the guys’ t-shirt section always have the coolest designs (I am so over the “Princess”, “My Little Pony” and “It’s all about me” lameness in the ladies’ section). It never occurred to me before now that I could pick out something more my “geek speed” from the men’s department, alter it as you shown above and still look feminine. I’m soooo with you on this one!! I totally agree! 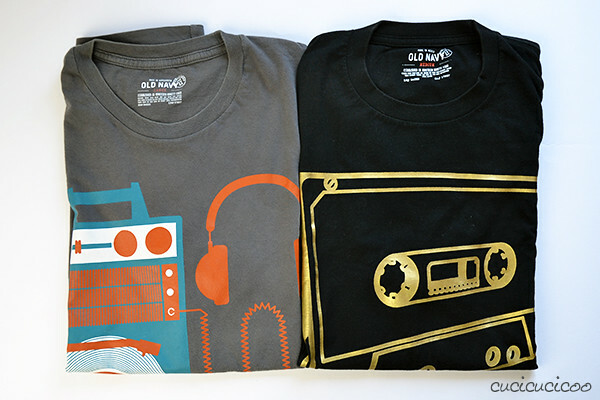 I hardly ever like the women’s designs, but there are so many cool men’s ones! This is brilliant! I’ve been trying to figure out how to do this, but couldn’t think how to do the sleeves. And now you’ve showed me. Thank you! Its really nice collection & brilliant idea.I totally agree with your ideas & designs shared by you. They are really very nice & awesome. Ahhhhhhhhh! Thank you!!! I’ve tried to feminize t-shirts at least 10 different ways, but it never looks right. This is it! Thanks so much for sharing this turorial! I’ve always wanted to do something like this but never took the time to figure out how to do it correctly. For some reason, T-shirt makers must think that nobody is an actual size small or medium anymore. I have so many awesome shirts that are HUGE on me, that I never wear because they feel big enough to fit over a major household appliance. I will definitely be trying this project on my own clothes! Yay!